"Analyzing the board won't help. Your mistake was thinking we're playing the same game." Reina Roja: Freedom Fighter (NOTE: Reina Roja in Spanish it means the "Red Queen") reigns supreme as the most directly corp-taxing ID currently available. As an Anarch she has quite a few tools at her disposal (perhaps with some help from the criminals) to mess with the corps servers and credit pool. Let's take a look! Tag-Me Tax: Account Siphon (borrowed from Criminals) combos are commonly included in many Anarch decks because it helps in two important ways: 1 it taxes the corp up to 5 each time it is used, secondly it can provide significant economy to the runner which is often an Anarch weakness anyway. Such synergy often comes at a price, in this case it comes in the form of tags. Putting pressure on the runner to pursue a tag-me strategy, where the gamble is to keep the corp poor so as to minimize whatever damage the tags can cause. One option to turn that tag into a benefit is to Data Leak Reversal where a poor corp may feel the pressure to trash Data Leak Reversal rather than pursue other options with such limited & resources. Chess Tax: What's better than a 1 tax? Even more! With 3 copies of Rook installed on a server in combo with Reina Roja: Freedom Fighter can potentially tax the corp 7 extra in a single run on top of the stated rez cost for each of the 3 pieces of ice. One strategy is to run on remotes encouraging the corp to rez such ice at a greater cost bankrupting the corp, then having free reign in the central servers protected by un-rezzed ice pumping up Medium Datasucker Nerve Agent, and/or using Keyhole & Imp etc etc. Focusing on taxing the corp can possible incur tags which in turn open the runner up to a host of trouble chiefly Closed Accounts, Scorched Earth & Psychographics etc. Unlike some ID's which concur a clear economic edge, adding to corp rez-cost doesn't necessarily add anything to the runner's bottom line. As an Anarch Reina Roja: Freedom Fighter has a bit more of a challenge putting an economy together. 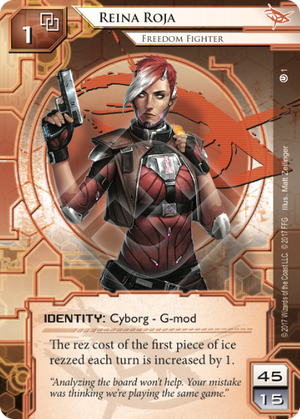 I like Reina Roja: Freedom Fighter, putting her in a deck that taxes the corp mercilessly can certainly be fun, but with fun there is always risk! See Anatomy of Anarchy for a really nice write-up on how to build a heavy-corp tax deck that has seen success.